I’m writing from Des Moines, whose Italian population is more established than that of Denver & whose red-sauce joints & pizza parlors are, therefore, better than Denver’s, pound for pound. I’m willing to go on record with that. Just last night we downed a couple of pies from Bordenaro’s, strewn with excellent capicola, crumbled sausage & chopped banana peppers, that beat the hell out of recent deliveries from Colore Pizzeria Moderna & even Kaos, which I usually like a lot—never mind the myriad disasters by the slice I faced a couple of months ago. The fact that the delivery guy from Colore appeared on our doorstep not 15 minutes after we called—that’s no exaggeration, even though the place a good 7 or 8 minutes away as the car drives—was the 1st bad sign. The 2nd was the appearance of the crust. You could tell by looking it would taste uniformly leaden & stale, presumably prebaked & then finished in such a way that, far from being black-&-blond, crackling & chewy & airy by turns, it was more like a hard unsalted pretzel. 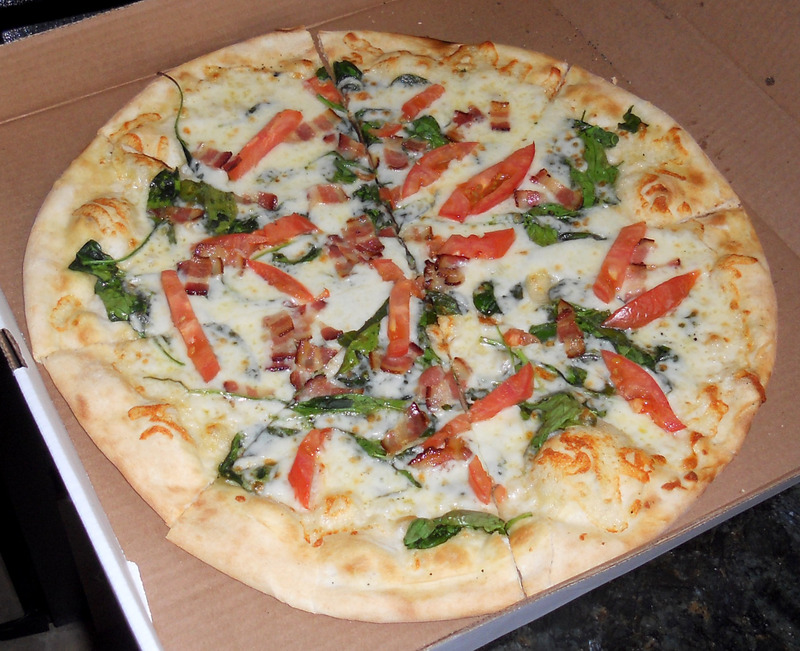 Our order from Kaos—the garlic-based BLT, a monthly special—also arrived within 15 minutes; though it’s only a couple of blocks away, that’s still not enough time to make a pizza—as should be obvious from the photo. Atop the underdone crust was a fairly stingy, uneven sprinkling of bacon. 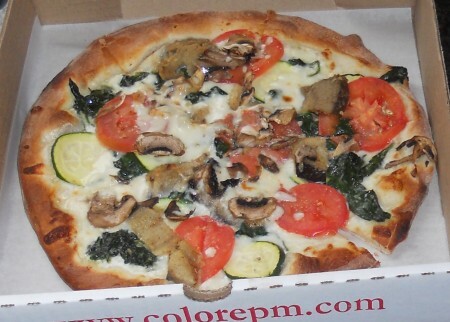 I don’t think this is a fair evaluation of Colore’s pizza. The pizza is best eaten at the restaurant, due to the thin crust. I realize that they offer delivery, but frankly, the plain cheese pizza does better in a delivery box than the gourmet selections. Before you completely deride the place, maybe you should go and eat in? I am a native of New Jersey and downstate New York….as in New York City, where the Italian-American population is better established than Iowa’s. I have also traveled in Italy. Your blog review grates me and I am not sure how reliable you would be on other eating establishments, if you base your opinions on one delivery. If you absolutely must eat the pizza outdoors, try Colore’s patio! Courtney: I agree totally that one has to a) try more than delivery & b) try a place more than once to get a fair shake. I try to qualify my reviews whenever either is the case, and if I didn’t so properly in this particular review, then that is definitely my bad. I too have traveled extensively in Italy, and lived in Boston for 10 years—where the Italian-American pop. is also well established—including in the North End, the city’s LIttle Italy. 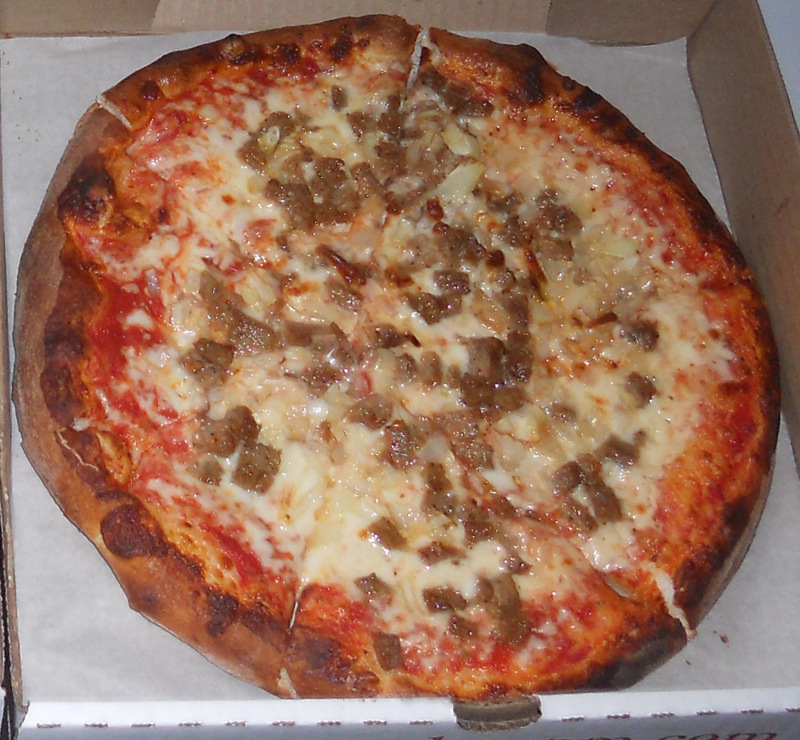 I have also had good pizza, delivery and otherwise, here in Denver. Based on your comment, I promise to give Colore another try.